Good evening! It's a great pleasure to meet you here in the City of London. I am sure we can look forward to a pleasant evening. I have come to Britain for a state visit at the invitation of Her Majesty The Queen. My hopes for this visit are to work together for greater progress in the China-UK comprehensive strategic partnership and bring more benefits to our two peoples. On behalf of the government and people of China and in my own name, let me first thank the Royal Family, and the government and people of the UK for your gracious hospitality. Let me also extend sincere greetings and best wishes to all of you here, to the friendly people of Britain, and to those from all walks of life in this country who have been committed to cooperation and friendship between our two countries. I visited the UK 21 years ago. That trip took me to a number of places, from London, Oxford to Glasgow and Edinburgh. I came into contact with the long history, unique traditions and brimming vigour of this country. Coming back here and seeing the towering Big Ben and rippling River Thames, I feel very much at home. Episodes of history keep flashing back in my mind: the English Bourgeois Revolution, Industrial Revolution, Chartism and Normandy Landings. I recall big names such as William Shakespeare, Lord Byron, Percy Bysshe Shelley and George Bernard Shaw, Francis Bacon, Oliver Cromwell and Winston Churchill, Thomas More, John Locke, Adam Smith, Charles Darwin, Arnold Toynbee and Joseph Needham. And I cannot but think of The Tale of Two Cities, Oliver Twist, Jane Eyre, Robinson Crusoe and Sherlock Holmes. Of course the list also includes Karl Marx, Friedrich Engels and many others. In the course of history, the Chinese and British peoples both created splendid civilizations that had far-reaching impact on human progress. Tea originated in China. Yet it was the British who enriched the culture of tea by creating the ritual of the afternoon tea. The Chinese people are enchanted by British literary classics, including the works of William Shakespeare, William Wordsworth, Jane Austen and Charles Dickens. And they love pieces of modern British art, such as Cats, James Bond movies, Harry Potter, Sherlock and Downton Abbey. In China you can find countless fans of football stars such as David Beckham and clubs like Manchester United and Arsenal. Over 150,000 Chinese students study in the UK, and more than 600 primary and secondary schools in this country have opened Chinese language courses, creating a boom of learning Chinese. This year, the first China-UK Year of Cultural Exchange, has witnessed dynamic exchanges between our artists. All this shows that the friendship between our two countries has been deeply rooted in the hearts of our people, which has laid a strong foundation of popular support for the long-term development of our bilateral relations. London is world-renowned for its history and culture, and the City lies at the very heart of London. Here one can feel the pulse of Britain's modern financial industry and its vibrant economy. This "Square Mile" manages US$4 trillion of assets, and contributes 3% of GDP. It is also home to the branches of China's five biggest banks. The RMB offshore market in London is developing fast, and the first RMB money market exchange traded fund (ETF) was launched at the London Stock Exchange. The City is both an epitome of deepening cooperation between our two countries and a vivid example of openness to the world. In today's world, openness, inclusiveness and mutual learning is a defining feature of our times. Despite differences in history, culture and systems, countries in this big family of human civilizations need to live together in harmony and as equals in the 21st century. They should respect and learn from each other, and reject any pride and prejudice. This is the only way leading to common development and shared prosperity. In today's world, interaction and interdependence is the general trend. With cross-border flows of goods, capital, information and people, regardless of distance, size and level of development, countries are increasingly finding themselves in a community of common interests and shared future, based on intertwined interests and common challenges. It is no longer consistent with the trend of the times to hold onto the Cold War mentality or engage in bloc confrontation. In today's world, peace, development and win-win cooperation is the main theme. World economic recovery remains sluggish. Global and regional hotspots keep flaring up. Global challenges such as terrorism, cyber security, climate change, and major epidemic diseases remain daunting. No country can stay immune in the face of unprecedented challenges. We must all work together in a responsible way and take coordinated actions to address them. In this complex and fast changing world, China's development has attracted growing attention. It is a subject of widely divergent comments and views. Some are "bullish" on China, others "bearish". Some even talk down China. There is both appreciation, understanding and confidence, and worries, doubts or misunderstanding about China. To understand and appreciate a country with over 5,000 years of civilization, 56 ethnic groups and more than 1.3 billion people is no easy job. The most appropriate judgement should be based on facts, rather than glimpses through the fog. Here, let me share some views on the questions you may be most interested in. First, the path that the Chinese people follow has been a choice of history. Where one ends up depends on where he is headed. For any country and nation, their development goals could only be achieved when they have found a path of development that works best for them. Over the past 37 years of reform and opening-up, the Chinese economy has been growing at an annual rate of nearly 10%, making the country the second largest economy today. Over 600 million people have been lifted out of poverty and per capita GDP exceeded US$7,000. China has managed to complete, in just several decades, the journey of development which took developed countries several centuries. This can only show that the Chinese people are following the right path. One may look into history to find guidance for the present. Since modern times, China experienced over a century of wars and turmoil. Over 100 years ago, the Chinese people began to open their eyes to the world around them and look for a new way to save the country and its people. Dr Sun Yat-sen, the pioneer of China's democratic revolution, came to Britain to study at one point. After repeatedly failed attempts at instituting constitutional monarchy and parliamentary and presidential forms of government, China finally chose the path of socialism. This is a choice made by history and by the people. As British philosopher Bertrand Russell pointed out, the Chinese people "understand their own country", and only "a solution slowly reached by themselves may be stable". The Chinese nation has always valued reform and innovation. China's socialism is guided by neither textbook doctrines nor rigid rules. It is a living thing that keeps growing and adapting through practice. Socialism with Chinese characteristics came into being in the process of constant improvements and adjustments through reform and development. Building socialism with Chinese characteristics is mainly about fostering the socialist market economy, democratic political system, advanced culture, harmonious society and ecological progress. It puts emphasis on the all-round development of the people, social equity and justice, and gradual achievement of common prosperity for all. According to ancient Chinese wisdom, "People don't need to wear the same shoes; they should find what suit their feet. Governments don't have to adopt the same model of governance; they should find what benefits their people." There is no one-size-fits-all development model in this world. A development path is most viable only when it brings benefits to the people in a sustained way. Second, what the Chinese people want is a better life. My country and people are working hard to realize the Chinese dream of the great rejuvenation of the Chinese nation. We have put forth the "two centenary goals", first, to double the 2010 GDP and per capita income and complete the building of a moderately prosperous society by 2020, and second, to build China into a prosperous, strong, democratic, culturally advanced and harmonious socialist country by the middle of this century. We are keenly aware that China remains the largest developing country in the world. By our own standard, there are still 70 million people living in poverty. The UN standard would put this figure at 200 million. It still requires long and painstaking efforts by the Chinese people to achieve a better life. The Chinese dream, an effort by the Chinese people to pursue a happy life, is closely linked with the dreams of people in other countries. China's development is facilitated by the development of the world, and it will bring about greater impetus and opportunities for the common progress of all countries. China is a responsible major country. We stood together with the world during the financial crisis and served as an anchor and engine in support of world economic recovery. Today, China's economic growth still accounts for nearly 30% of global growth. We are speeding up a new type of industrialization, IT application, urbanization and agricultural modernization. We are committed to developing our capital markets, improving the open economy, and working for greater balance between China's import and export and between inbound and outbound investment. China is vigorously promoting an innovation-driven development strategy. In his series of books entitled Science and Civilization in China, Joseph Needham discussed the achievements in science and technology of ancient China. China will closely follow the trend of science and technological revolution and work hard to achieve first-class results in this field. In the next five years, China will import over US$10 trillion worth of goods and invest over US$500 billion overseas. Chinese travellers will make more than 500 million trips abroad for business, sightseeing and shopping, which is without doubt a big lift for the world economy. China stands ready to work with the UK and the international community to unleash greater potential with real actions and achieve better development. Third, what the Chinese people long for is a world of peace and development. Generations of Chinese people have been brought up learning the tenets that peace is most precious and that one should seek harmony without uniformity and promote peace and benevolence among all countries. Love of peace is part of our DNA. The sufferings the Chinese people went through in modern times have only made peace more precious for the Chinese people. Their dedication to development requires peace more than anything else, and their longings for a better future have made them more ready to uphold peace. We are committed to the path of peaceful development and reject the logic that suggests that a rising country would always seek hegemony. China's determination and will to follow the path of peaceful development is never to be shaken by anyone, anything or for any reason. China calls for the building of a community of shared future for mankind. We stand for promoting a new type of international relations featuring win-win cooperation and greater democracy in international relations. We support taking the right approach to justice and interests and resolving differences and disputes between countries peacefully through dialogue and consultation. We will join hands with all countries to uphold world peace, safeguard fairness and justice and advance common prosperity. China has benefited from cooperation with the international community, and it will contribute to the development of the global family. China advocates international cooperation and practises multilateralism. We will unswervingly follow a win-win strategy of opening-up. As our capabilities grow, we will shoulder more responsibilities to the best of our ability, and contribute China's wisdom and strength to world economic growth and global governance. China's development will not come at the cost of other countries. It will only serve to expand common interests. China will stand firm with all other countries to meet whatever challenges that may lie ahead. Roads will only become broader when more people travel on them. China and the UK may be geographically far apart, yet we feel close to each other. 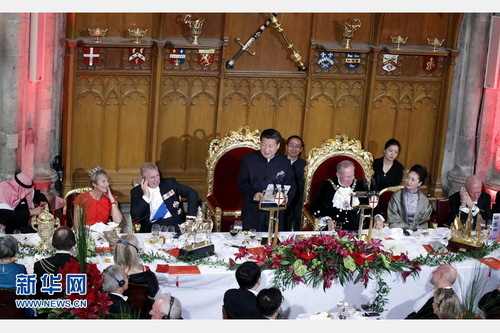 China sees in the UK an important partner and a sincere friend. Since the end of World War II, China's relations with the UK have on the whole led the way in the relations between China and Western countries. In recent years, our relations and cooperation have been making big strides on the fast track of steady and sound development. The UK is China's second largest trading partner and investment destination within the EU, and the biggest offshore RMB trading centre after Hong Kong. China is the UK's second largest trading partner outside the EU and the top investment destination in Asia. From daily necessities such as food, clothing, housing and transport, to energy, infrastructure, finance and scientific research, the fruits of our practical cooperation have brought real benefits to our people's everyday lives. Over 30 years ago, guided by the exceptional strategic vision of Mr Deng Xiaoping and Prime Minister Margaret Thatcher, our two countries found a creative solution to the question of Hong Kong, setting an example of resolving historical issues in a peaceful way. More than 30 years on, the UK became the first major Western country to apply to join the Asian Infrastructure Investment Bank. I hope the UK will continue to be a trendsetter and an example of openness and inclusiveness in carrying out cooperation with China. We look to the UK to assume a leading position in the cooperation between China and Western countries, and fulfil its aspiration to be "China's strongest advocate in the West" with concrete action. - We should take a farsighted and strategic approach and always bear in mind the overall picture and major trend of our bilateral relations. We should enrich our comprehensive strategic partnership, increase strategic communication and political mutual trust, and make sure that ideological differences or specific disagreements would not come in the way of long-term and steady growth of our relations. - We should be open and inclusive and see each other's development as opportunities. We should continue to advance bilateral cooperation in a flexible and pragmatic way, move faster to synergize our respective development strategies, and deepen cooperation in business, investment, finance and infrastructure. Efforts should be made to enhance people-to-people and cultural exchanges and facilitate inter-civilizational dialogue between East and West. We should also work together to uphold an open world economy and promote cultural diversity in the world. - We should follow the principle of win-win cooperation and deepen our bilateral relations and all-dimensional cooperation. We should synergize China-UK cooperation with China's initiative to build the Silk Road Economic Belt and the 21st Century Maritime Silk Road, spur China-Europe cooperation with the good momentum of China-UK cooperation, and promote common development and prosperity of Asia and Europe and the world at large, to the benefit of both countries and all sides involved. - We should be bold and pioneering in our approach and update our cooperation by tapping new potential, stimulating new energy and generating new impetus. We should learn from each other's governance experience, help advance each other's reform, be brave in proposing creative ideas for international cooperation and lead the world trend of development and reform. "To be, or not to be, that is the question." This line from Hamlet has left a lasting impression on me. When I was barely 16 years old, I left Beijing for a small village in northern Shaanxi Province to be a farmer and spent seven years of my youth there. Back in those days, I tried every means to lay my hands on William Shakespeare's works, reading A Midsummer Night's Dream, The Merchant of Venice, The Twelfth Night, Romeo and Juliet, Hamlet, Othello, King Lear and Macbeth. I was captivated by their dramatic plots, vivid characters and emotional intensity. Standing on the barren loessland of Shaanxi as a young man, I often pondered the question of to be or not to be. Eventually I made up my mind that I shall dedicate myself to serving my country and my people. I am sure that Shakespeare not only appeals to readers with his literary talents, but also inspires people's lives in profound ways. Chinese playwright Tang Xianzu of the Ming Dynasty was acclaimed as the "Shakespeare in the East". He produced a number of world-famous works, such as the Peony Pavilion, Purple Hairpin, A Dream under the Southern Bough and Handan Dream. Tang was a contemporary of Shakespeare, both of who died in 1616. Next year will be the 400th anniversary of their passing. China and the UK could jointly celebrate the legacy of the two literary giants to promote people-to-people exchanges and deepen mutual understanding. According to ancient Chinese philosophy, "All good principles should adapt to changing times to remain relevant." Francis Bacon wrote, "The golden age is before us, not behind us." In my meeting with Prime Minister David Cameron today, we agreed to open a "golden era" of the China-UK global comprehensive strategic partnership for the 21st century. Let us act now to seize the opportunities of our times to jointly usher in the "golden era", and together make new and greater contribution to the noble cause of peace and development of mankind. To the Rt Hon Lord Mayor and the City of London.